Inclined Lifts - Access Solutions, INC. The Harmar Sierra inclned platform lift includes a 500-lb. capacity, DC-powered worm gear drive, constant pressure rocker switch on platform, infared remote, power folding access ramps for entry and exit and under platform safety pan. This model will accommodate most straight staircases and is intended for residential applications only. Free Standing Post Kit will allow for wall-free installation, attaching to stair treads only. However in some cases installation may require additional wall bracing. This inclined platform lift's space saving design folds to approximately 13" from wall when not in use. 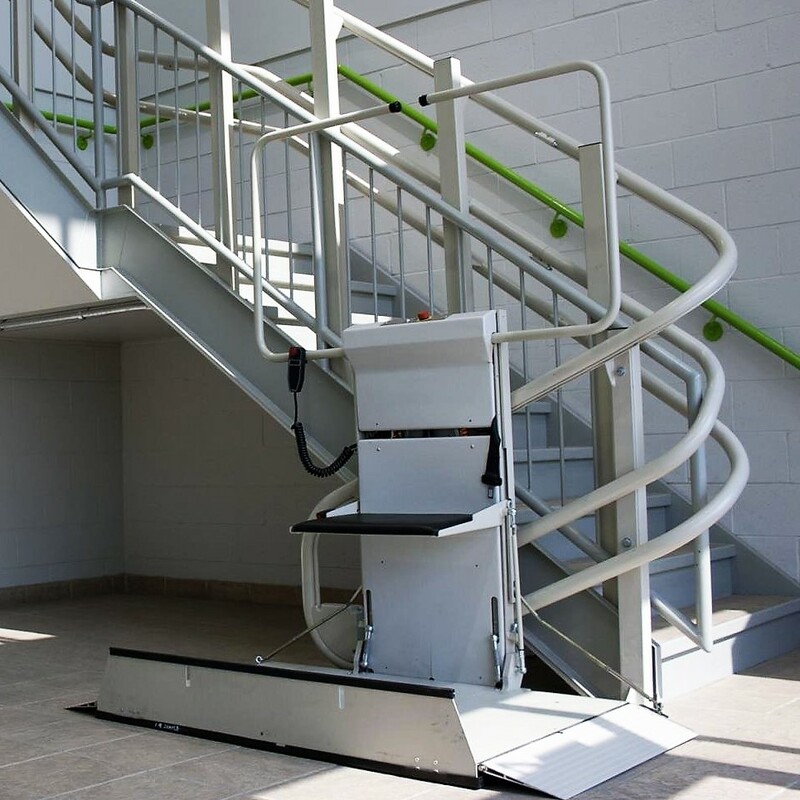 The Savaria Delta inclined platform lift features a 550-lb. capacity, DC powered rack and pinion drive, automatic charging station at top and bottom of rail, constant pressure buttons on platform and platform safety pan. This model can be used in either a residential or commercial application to provide access over a single flight of straight stairs. The motor is housed on board the unit with no need for additional space for a machine room. The manual folding platform allows easy access to stairs when the inclined platform lift is not being used, making this a popular choice for schools, churches and other public buildings. 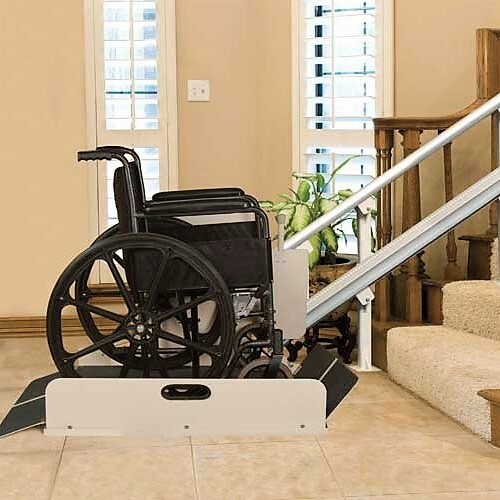 The Savaria Omega inclined platform lift features a 550-lb. capacity, constant pressure controls on platform,pedestrian warning light and movement alarm. This model can accommodate most residential and commercial applications and can be configured for inside and outside curved stairs, multiple levels, itermediate landings or spiral staircases. Motor is unobtrusively installed at the top landing, with the controller located remotely keeping the visible components to a minimum. 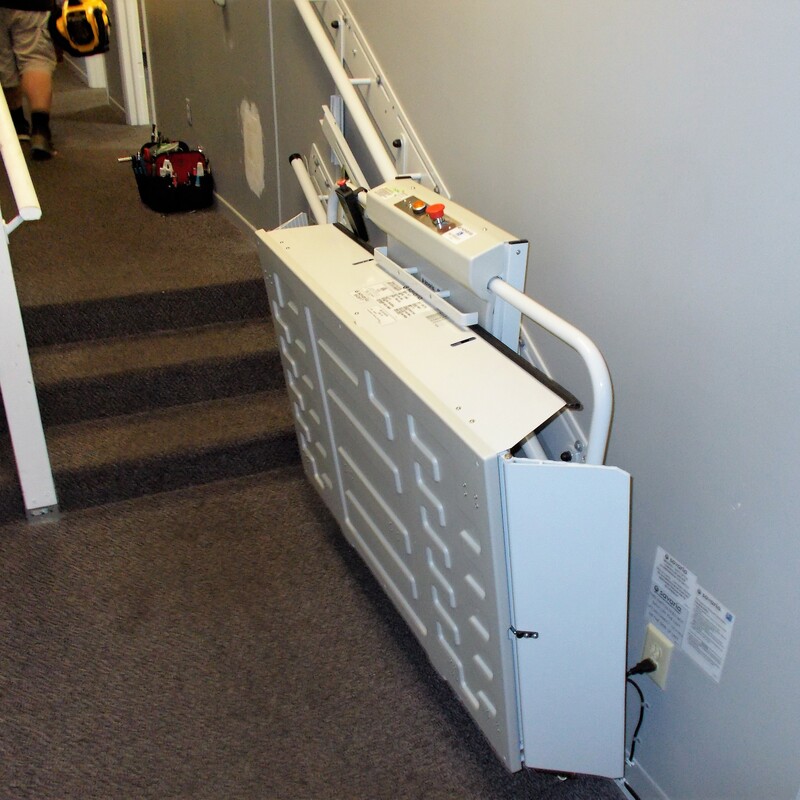 The power folding platform still allows access to the stairs when the unit is not in use.